Discussion in 'the Art of Noise' started by luckynines, Jun 3, 2009. I cant believe these guys haven't got a thread yet! Australian fantasy pop duo Empire of the Sun have come fourth on the BBC's Sound of 2009 list, which features the best bands and singers to watch in the next 12 months. One act from the top five is being unveiled every day this week, counting down to Friday, when the number one will be revealed. Empire of the Sun are on a spiritual mission. Dressed as extras from a psychedelic Star Wars, the duo are on an epic journey to seek out ancient cultures across the globe, searching for inner enlightenment while creating a musical dynasty that will last for ever. It seems like a tall order. But the ambitious, enigmatic and utterly egotastic Empire of the Sun are dead set on their task. So their debut album, the story it tells and the places it takes them is "a walk to finding the inner being", singer Luke Steele says. "It's kind of like a spiritual road movie. "We went to Shanghai and met the emperors, and we went to Mexico and met the Aztecs, and now we're going to Iceland. "It's now or never and we have to push the limit. There's no holding back and there's nothing to lose. We really want to make something otherworldly and special." Steele, who also fronts indie group The Sleepy Jackson, has teamed up with Nick Littlemore of electronic outfit Pnau, who is friends with Sir Elton John, has worked with The Killers and been in a band with Ladyhawke. Together, the pair's 1980s-influenced soft pop synthesisers and blissed-out space beats have already taken them into the Australian top 10. The music is coupled with a striking image of two colourful, cosmic crusaders that has been inspired by movie characters and rosily-remembered childhood idols. "We are superheroes. We are Emperor Steele and Lord Littlemore," proclaims the singer. In the video for their first single, Walking on a Dream, the pair are seen in front of the Shanghai skyline striking overblown, dramatic poses. Steele grandly waves huge feathers and a big red stick while wearing white face paint, a bright blue oriental frock coat, gold ceremonial neckwear and a tall ornamental crown that looks like it might have been a rather nice lampshade in a former life. "We've done the band thing, which is great, but we wanted it to be a lot more epic and theatrical," he declares. "We want to start something a bit bigger than what bands have been for the past 20 years. We want to bring entertainment and colour and positivity and melody back into it." The album, also called Walking on a Dream, was made over two years between other projects. "I was only ever in town for a night in Sydney, where the studio was, so it was all quite spontaneous," Steele says. "I'm really good at writing top lines and coming up with chord progressions and production." Littlemore is all of the above plus is "amazing in terms of writing words", the singer says. "He's quite romantic with his words. He's like a beat poet." The group borrowed their name from a 1984 JG Ballard novel, which was adapted for the screen by Steven Spielberg in 1987. "We wanted something quite epic," Steele says, citing the history of Chinese emperors and the importance of the sun to the Aztecs. "And obviously Jesus Christ is the son of God and everything," he adds, slightly inexplicably. "We were looking for a name and we saw that and it just seemed so fitting." The singer now wants to blow the minds of young fans in the same way that pop stars did when he was growing up in the 1980s. "We're so visual," he says. "We want to make something that as a child you see and you just love because it's so colourful and it's got imagination. "Music is magic, and with imagination combined it can be completely epic. We've been both on the road doing shows for the last 10 years and we wanted something that's higher - visually, mentally, physically, a bigger level, a bigger vision that can last for ever." More than 130 leading UK-based music writers, editors and broadcasters took part in Sound of 2009. They named their three favourite new acts and their responses were used to compile the list. Find out more here. their songs are amazing, walking on a dream and we are the people always cheer me up! My fav songs: We are the people and Swordfish Hotkiss Nigh. i LOVE "we are the people"
"walking on a dream" is also one of my fave songs. can't get tired of it..
Half Mast is my favorite from them. Very haunting and...I just love it. 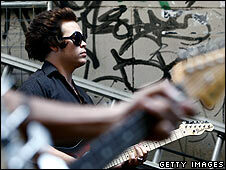 Empire Of The Sun's Luke Steele has said he plans to release three albums this year. 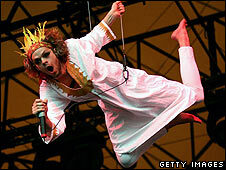 Steele told NME.COM he's currently working on the second album for Empire Of The Sun, as well as a new record from his other band The Sleepy Jackson and a "punk rock" solo project. Speaking of Empire Of The Sun album, Steele confirmed that he's not currently in contact with bandmate Nick Littlemore who left the band suddenly in early 2009), but added that that hasn't deterred him from persevering alone. "Some of it is like Mylo and a bit more Prince. It's dramatic," he said of the album. Meanwhile, Steele says he wants The Sleepy Jackson's new album to be "classic songs the whole way through", while another album - his "punk rock thing" – will come out under the title Icon Python. "I'm really excited about that one because it starts on the blues and I just go rad on it," he said of the record, which he says is "90 per cent" finished. "Half Mast" is my favorite song from them as well. Lately, I can't stop playing the new version of "Without You" though. That's really too bad Nick Littlemore isn't apart of the band anymore. 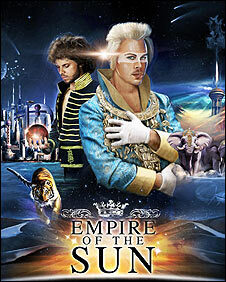 On March 11, 2013 Empire of the Sun revealed the debut trailer for upcoming album Ice on the Dune. The trailer was directed by renowned American film director JJ Abrams and the album was revealed with a release date of June 2013. The newly launched website for the album features placeholder links for upcoming content provided with dates for March 15th, March 22nd, March 29th, and April 8th.